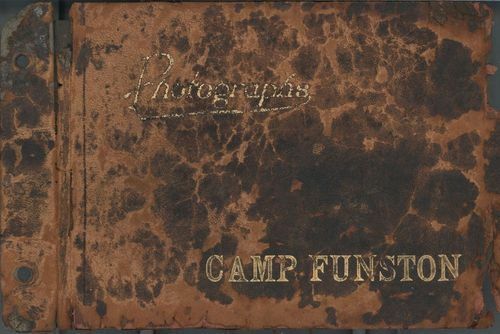 This photograph album contains scenes of Camp Funston compiled by Clarence Raymond, who was stationed at the camp. Included in the album are photographs of a variety of buildings including the post exchange, a post office, theatre, "rustic rest room" and a YMCA. Other images capture soldiers, military maneuvers, the First Kansas Territorial Capitol, an infirmary, weapons, troops and equipment, soldiers with weapons, living quarters, and numerous images of his future wife, Bernice Howe. Camp Funston, built on the Fort Riley reservation near Junction City, Kansas, was one of sixteen Divisional Cantonment Training Camps established at the outbreak of World War I. Construction began during the summer of 1917 and eventually encompassed approximately 1,400 buildings on 2,000 acres.